Venture into a world where magic is real…and excitement knows no bounds at The Wizarding World of Harry Potter™, at Universal’s Islands of Adventure®theme park. With the opening of Universal’s new water park, Volcano Bay, there are now even more vacation package and ticket options. Do you need a 2-park ticket, a 3-park ticket or express pass? Contact me to help you find the best package & options for your visit. Save $330+on a 4-Night Vacation for a family of four. For a limited time, experience all the awesome of Universal Orlando Resort for less. Hurry, offer ends Nov. 14, 2018. Savings value is based on $180 Promotional Discount+off the 3-Park – 4-Day Park-to-Park ticket online price for 2 adults with 2 children and an additional $150+Promotional Discount off the total Vacation Package Price. Amp up the awesome with four days for the price of two. Explore Universal Studios Florida™ and Universal’s Islands of Adventure™ with a 2-Park ticket. Or, add the thrills and relaxation of Universal’s Volcano Bay™ with a 3-Park ticket. Purchase by Mar. 14, 2019. Use by May 31, 2019. Blockout dates apply from Dec. 26–31, 2018. The 3-Park offer applies to Park-to-Park tickets only. Take your vacation to the next level of awesome with the thrills and relaxation of Universal’s Volcano Bay™ (Opening May 25, 2017), a water theme park like no other. Plus, jump into the action of your favorite movies at Universal Studios Florida™ and journey through legendary worlds at Universal’s Islands of Adventure™. Stay where you scream, though you may be too afraid to close your eyes. Script an incredible day of fun at Universal Studios Florida™. Journey through legendary worlds at Universal’s Islands of Adventure™. And find an oasis of excitement along with laid back luxuries at Universal’s Volcano Bay™. Plus, as the sun sets on a day of thrills, confront your fears at the World’s Premier Halloween Event at Universal Studios™. For a limited time, save3 $100 when you book by 9/2/18. Starting prices are based on Sunday – Thursday travel September 14th to November 3rd, 2018. Beginning this November Universal Orlando Resort™ takes the Holiday season to new heights with an incredible lineup of festivities. Experience Christmas in The Wizarding World of Harry Potter™, Universal’s Holiday Parade featuring Macy’s, and more. You’ve never had a holiday like this. This festive package includes a 5-night hotel stay, theme parks tickets and more. Holidays event dates will be announced soon. Blue Man Group is comedy, theater, a rock concert and unforgettable dance party all rolled into one. Don’t miss the show that has captivated 35 million people worldwide. Dare to live in full color. Buy your tickets in advance online and save $10 off the box office price. 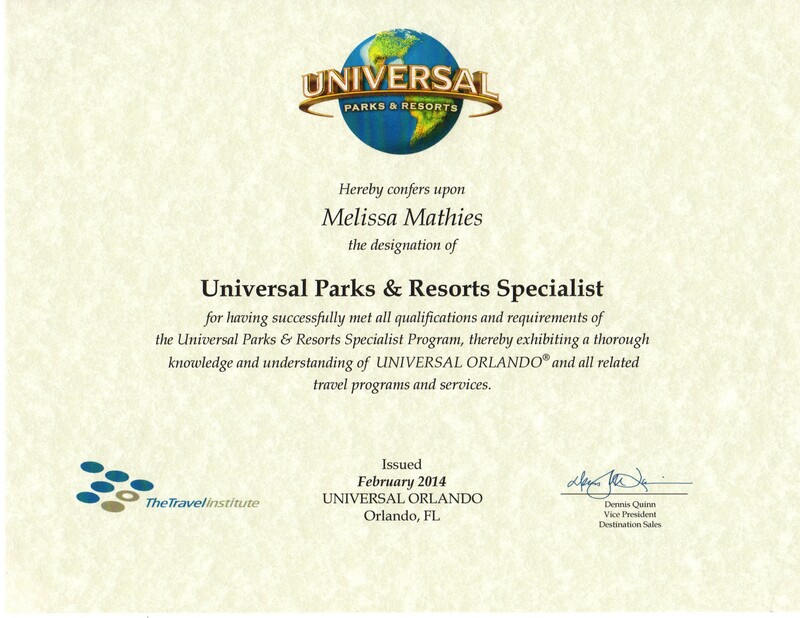 My name is Melissa and I love Universal Orlando. They are constantly coming up with new & innovative attractions & shows. Living only 45 minutes from the parks, and being an annual passholder I visit frequently. I am happy to help you book and plan your next vacation based on countless hours of education and personal experience. My expertise comes at no added cost to you when you book your next Universal vacation through me. Contact me to chat about your trip to the Wizarding World & beyond.